Peter Lundgreen via Caixin | My best guess is that more than 99 percent of all economic analyses from the end of 2015 predicted a higher GDP growth in France this year. I myself have since long been skeptical about the economic growth prospects for the Eurozone, including that of France. The French government now plans to reform the labor market to add momentum to the economy. Perhaps, I must reform my own assessment of the growth prospects for France in light of this development. Since 1995, France had a budget deficit, which ballooned over the years. The few times that the deficit reduced on a relative scale, it was partially due to the way it was calculated. Because the deficit is shown as a percentage of the country’s total GDP, the deficit as a share of GDP declined during years with high GDP growth. This effect was seen from 1998 to 2000 just before the dot.com bubble burst. A similar effect was visible in the years ahead of the financial crisis that also ended in a recession. This fluctuation in the deficit reflects the reality of the French economy, which bobs along with global economic waves, and is fuelled by a continuous domestic economic stimulus. The economic stimulus compensates for unresolved issues such as poor competitiveness compared to other countries in the Euro zone. The persistent and large annual budget deficit in France is a looming concern in financial markets. I have argued that France’s GDP growth is almost a function of the global GDP growth without its own strong engine of growth. My concerns about France’s economic prospects have increased because international trade volumes are dwindling and global growth is under pressure. France’s GDP grew by 1.1 percent last year but this increase comes after several years with very low and even negative growth, when the economy shrank. In an optimistic moment last fall, the International Monetary Fund (IMF) estimated that France’s GDP would rise by 1.5 percent this year. Then this forecast was hurriedly revised down to 1.3 percent. The only institution expecting a 1.5 percent GDP growth this year is the French finance ministry. The ideas proposed by French Economic Minister Emmanuel Macron in January seem interesting. The centerpiece of his plan, and a sticking point in the French reform discussions, is the labor market. Macron pointed out at the time that the reforms would be radical. Other government members have also made proposals. One main pillar in the reforms is to make it easier for companies to lay-off employees. Moreover, there will be an attempt to end the 35-hour working week as companies should be allowed to negotiate longer work schedules for workers. Some proposals include working weeks of up to 48 hours and working up to 12 hours per day. Some of the labor market reform proposals would mean a dramatic deregulation relative to the rest of Europe. It does not seem likely that such a significant deregulation will be adopted. But the political signals are unclear because several policy makers try to grab the limelight with reform suggestions. The next presidential election in France will take place in 2017, though the incumbent president, Francois Hollande, and the government is unpopular. There is turmoil in the government. Several politicians who have received a lot of media coverage for their reform proposals are now competing to get selected as the next presidential candidate of the Socialist Party. This makes it difficult to assess how strong their real desire for changes is. Certainly easing the rigid rules governing the labor market would be positive for France in the long run. Some parts of the ruling Socialist Party have opposed these proposals. 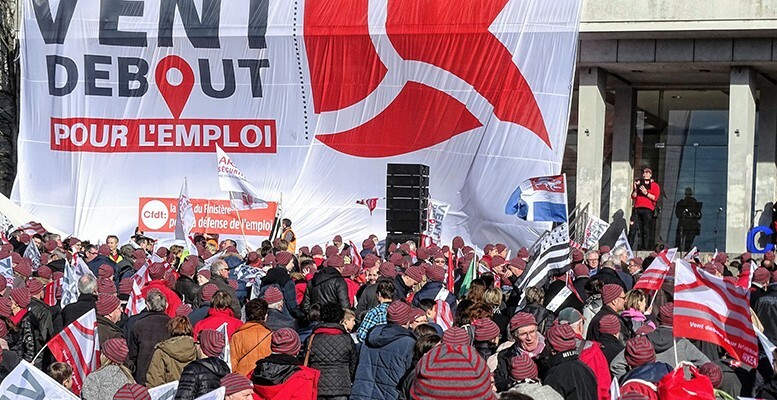 The unions are protesting and there have been many demonstrations during the past weeks with close to 400,000 people demonstrating on March 31. I argue that the belief that reforms would lead to higher GDP growth this year is overly optimistic. Media reports say the Governor of the French central bank, Francois Villeroy de Galhau, was particularly sharp in his criticism of his government in recent weeks. His criticism was that the government had once again delayed reforms to the labor market. However, the governor argued that the path to growth is to push investments up. I regard this as less realistic in a world with overcapacity in manufacturing. My observation is that countries with a robust GDP growth currently are the ones with strong domestic consumption. France is among the countries with robust private consumption as consumer confidence is high despite a slight dip last month. This latest decline was partly due to households’ assessment of their own financial situation plus a growing concern about unemployment. I am not convinced at all that labor market reforms will be impressive. But should it happen, then a short-term negative impact on private consumption is likely to take place. I am convinced that the current uncertainty over possible changes in the labor market will cause consumer confidence to fall further. I keep my view from last year, that the most likely scenario for France is lower GDP growth in 2016. So far, I see no reason to change this view unless the French government comes up with a different economic reform agenda.